I love it when the Lord sends a book my way. He always plans it as the right time...just when I need the message. The biggest surprise to me is that the ministry of this book has nothing to do with the great discussion of sexual identity and the Bible, NO- this book is a beautiful exposition on a comprehensive Scriptural application of how repentance and faith should be the daily posture of a disciple of Jesus. 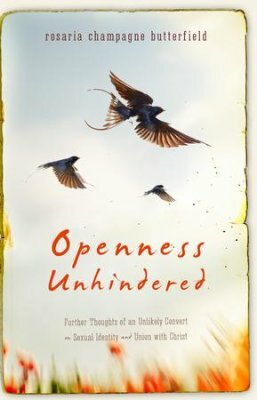 I was not familiar with Butterfield, nor have I read her first book in which she details her journey to Christ from the world of women's studies and gay activism to ending up the wife of a reformed presbyterian pastor who homeschools a house full of kids.... a journey she calls 'a train wreck'. Her story, her past, and he reliance on the Bible creates the best and worst of all possible tensions in her life; taking shots from inside the church and the outside world as she meticulously applies the truth from her faithful exegesis of God's revealed truth. Early in chapter two, she confesses a deep desire "And often I long for just one person in church to understand me." It would be easy to dismiss that as the heart cry of a woman who attended church and wrestled with the gospel in the midst of a lesbian relationship. In reality, it is the heart cry of a lover of literature who was so enraptured by God's written word that it has transformed her very being in ways that few christians understand. How powerful is the Bible? Just look at the radical change of heart and perspective of Rosaria. That is why God sent it my way... I often am just another fool who thinks I can walk in the Spirit without the daily search lamp of God's Living Word in my daily life. If God's holiness seems foreign to me or I find myself just tap dancing through the empty routine of christian lingo or jargon- it is always the same issue- I have become a stranger to His glorious truth. I wish I could somehow entice my children to devour this book.... and that it would do for them what it did for me... make me thirsty and hungry for God's Word. That motivation comes from the discipline of repentance... something I tend to relegate to a prayer I prayed 30 years ago... but the call of repentance is daily... maybe even hourly in my life. It is my understanding that the earlier book is short- called a memoir "Thoughts of an Unlikely Convert" and this book dives deeper into the process of conversion, repentance, and Christian community. The radical change, combined with her life experiences produces clarity of thought as she then discusses the debate of the multiple layered/complex issues of human sexual desire, sexual practice, and identity. This type of apologetic is needed in other issues as well- medial ethics, social justice, race relations, lifestyle, politics.....to name just a few. Her apologetic? IT IS SIMPLE.... "Did I really want to understand (_______________) from God's point of view, or did I just want to argue with Him?" She filled in the blank with homosexuality, but that blank has room for a lot of issues we struggle with. We know what the Bible clearly says.... it is necessary for all humans to have the eyes of their heart opened to see sin properly, to understand the gospel, receive the grace to believe, and be justified and adopted as a son/daughter of the King. That process took many years for Rosaria. But the spark of hope showed in a very humble confession.... 'for the first time in my life, I wondered if I was was wrong'. And again, the Bible was key in arresting her rebellion... and she fought it valiantly. "I straddled two worlds and two lives for two years." "After years and years of this, something happened. THE BIBLE GOT TO BE BIGGER INSIDE ME THAN I." "The image of me and everyone I loved suffering in hell crashed over me like shark-infested waves of a raging sea. Suffering in hell not because we were gay, but because we were proud. We wanted to be autonomous. It was our hearts first, and our bodies followed. I got it. I heard it. Finally. I counted the cost and I did not like the math." "But God's promises rolled in like another round of waves into my world." Also, the people who stood with her and loved her in the process were there as well. Rosaria's story is as much about a loving church as it is about the loving God at its head. This was the concept that I needed to reclaim in my world of pride and rebellion. Thirdly, Repentance is necessary to continually fight the ever present indwelling sin in believers. WE ARE ALL CALLED TO FORSAKE THE SIN WE LOVE BEST. Finally, Repentance has a goal...obedience and holiness which pleases and glorifies God. This is also the final release of the enemy's accusation of shame. "Sin must be dealt with in a posture of Christian combat, not in expected or celebrated defeat and failure. We are to use the full armor of all the means of grace that God gives to us. This (daily posture) teaches us that conversion gives you freedom from the crime of sin and gives you the liberty to respond to God's grace of conversion through repentance and obedience.... it was then that I got it: repentance and the love of God- and the obedience to His law that grows from them- were the missing links between shame and grace." I hope this will inspire you to find and read this book.... for a few days, I had Rosaria in one hand and Romans 1-8 in the other.... taking time to ponder anew the glorious gospel. And I crawled back to a renewed desire to battle the weariness of my sin.